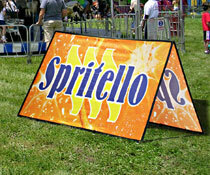 Could your company's marketing plan benefit from using pop-up banners at special or outdoor events? 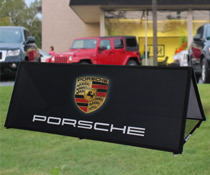 Our custom printed collapsible sideline signs are ideal for many different types of businesses and organizations. Pop-up banners for high visibility advertising are often associated with sporting events such as soccer or golf tournaments, but they have many other commercial applications such as outdoor trade shows and promotional events. These customizable sideline displays offers unique sizes and shapes for unparalleled visibility in large public venues. Their simple folding design allows this folding fabric signage to be placed in any location and weighted for maximum stability. 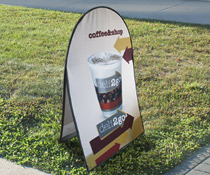 These pop-up banners, also known as collapsible fabric A-frame signs, are some of the least complicated and most portable promotional display signage styles available on the market. Curved, oval, and rectangular configurations are in stock to match any type of event and layout of an outdoor exhibit area. These custom printed pop-up banners, frequently used for sideline advertising at outdoor sporting or commercial events, are extremely effective when used for branding or as directional signs. Photographic quality silkscreened graphics can showcase brand logos, messaging, advertisements, and wayfinding information. These long-wearing polyester pop-up banners are popular for the folding design that makes them easy to set up, take down, and transport from event to event. Why are these fabric sideline displays an excellent choice for outdoor promotions? Pop-up banners feature simple collapsible designs that are easily to transport, store, and set up at events. They are also available in a variety of sizes to meet any visual marketing needs. Sideline displays can be set up and disassembled in a matter of seconds and include carrying bags to protect the advertising fixtures when not in use. Full color polyester outdoor banners feature completely-customized, user-submitted graphics that allow for branded and targeted graphics and messaging. Folding fabric banners have flexible fiberglass rods that provide the framework for the entire unit. This type of promotional merchandiser even comes with straps that can be weighted down for additional stability in windy conditions. Metal stakes are also included to keep the popup a-frames in place when used on softer surfaces. 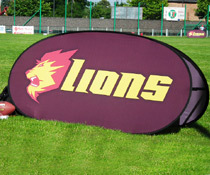 Sideline banner displays with custom printed fabric offer high visibility as well as ease of portability. 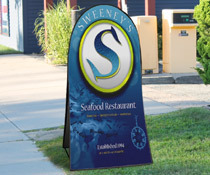 Each of these promotional signs for business is lightweight, collapsible and transportable. The fold-up fabric displays are advertising stands made from weatherproof components, so they can be used successfully in fair to moderate weather conditions. From trade shows to sporting events, this lightweight signage is versatile enough to communicate distinct information to target audiences. Even though the printed a-frame signage is engineered for outside use, it is still very effective as interior marketing equipment. These custom sideline a-frames are available in a number of sizes that suit any budget or space requirement. Although folding sign frames are commonly seen outside on the side lines at sporting events such as soccer matches, golf tournaments, equestrian events and dog shows, they are also a valuable addition to many indoor events as well. These economical custom printed signage fixtures are perfect for attracting customer and visitor attention to branding graphics, logos, or product and service messaging. Indoor use at tradeshows and conventions is increasingly popular due to the ease of setup of these fold up fixtures. These simple, lightweight folding fabric frames can be easily placed atop tables or in booths to attract customer attention. Printed sideline barrier displays are an ideal addition to any business, facility, or organization's marketing toolkit because they are a sure way to grab attention with bright, large-scale brand boosting graphics for logos and taglines. These high visiblility fixtures are ideal for use singly or in groups for effective messaging around products, services, and brand concepts. AdvertisingBannerFlags.com offers big savings when items are bulk purchased, fast turnaround for single and multiple orders, and competitive pricing on full color customized printing. These folding sideline barriers are a best bet for any business, particularly those that rely on outdoor events to get the word out about their goods, services, and brand.